The mood was relaxed and the pace was rapid at the Aug. 18 meeting of the Unionville-Chadds Ford School Board, which wrapped up its agenda in about 40 minutes and capped the evening with an icy bath for board president Victor Dupuis. 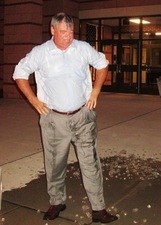 On Aug. 15, school superintendent John Sanville Tweeted a photo of himself accepting the ALS Ice Bucket Challenge by donating $100 to ALS research and dumping a cooler of icy water over his head. The fundraising effort, spurred by social media, has raised more than $16 million nationwide and turned into an obligatory photo-op for celebrities. Sanville challenged Dupuis, who stood by the front door of Unionville High School after the board meeting and wryly thanked Sanville for putting him up to the stunt. “I was challenged by Mr. Sanville to do this, much to my chagrin,” Dupuis said with a grin. “I am going to call out some of my fellow school board members – Mrs. Do, and Mr. Lindner, and Ken Batchelor.” Upending the cooler over his head, Dupuis shivered and said, “That's really cold” as ice cubes scattered on the sidewalk. At the meeting beforehand, Sanville noted that the school year starts next week. “I love the start of the year," he said. "With it comes the hopes of the 4,100 students who come to our buildings, excited to learn. Today we had convocation, which is our first meeting with teachers and staff, and I think it was a resounding success. I think we have everyone motivated and excited to start the year." In response to a state mandate, the board approved adding the Keystone Exams to the list of requirements for graduating seniors. Students graduating in 2015 and 2016 need to complete a culminating project. Beginning with the class of 2017, students will not have to do a project, but will be required to show proficiency on algebra 1, biology and literature Keystone Exams, or “a related project-based assessment.” Students will be allowed to take the Keystones several times, but if they cannot pass the tests, the alternative project can be assigned. The board did not have to vote on beginning the bus program, because there is no expense for the district. The buses are expected to pay for themselves through sales of bus passes. Among a long list of hires for the upcoming school year, the board approved adding a first-grade teacher at Pocopson Elementary School to handle student enrollment that is at the maximum number recommended for first graders. Colleen Dougherty has been hired at the school, effective Aug. 18. Hellrung, in his comments at the end of the meeting, thanked the Chester County Intermediate Unit (CCIU) for its handling of an investigation into residency requirements for families in the district. The long-running issue of families living outside the district but still sending their children to district schools was the focus of an independent review conducted by the CCIU. "I'd like to thank Dr. Joseph J. O'Brien [the CCIU executive director] and his staff for the residency investigation," Hellrung said. "Not only is he the most qualified person to do the exam, he did it almost for free. And it wasn't easy. He was having to make some decisions that some people may not like, but he maintained his integrity throughout. ... I just want to highlight the conclusions in the report -- that there are no non-resident students that we know of attending our schools. If there are allegations, they are investigated. There were no deals made by Dr. Sanville. Our policies on residency are in good order, and they are cost-effective." The full report is posted on the CCIU website at www.cciu.org/UCFSDreport.